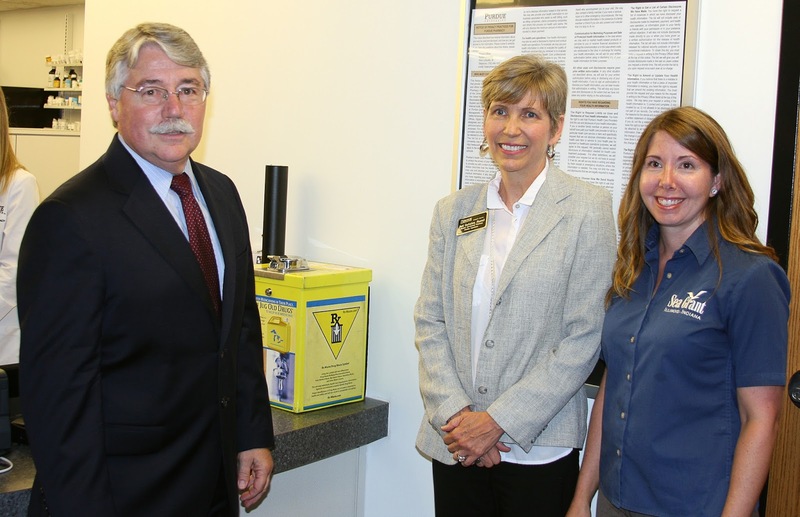 Last week, the Purdue University Retail Pharmacy became the latest participant in IISG’s multi-state effort to help communities properly dispose of their expired, unused, and unwanted pharmaceuticals. This is the first pharmacy-based collection program that IISG has helped to start. 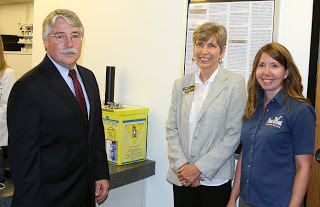 Collaborators also include the Yellow Jug Old Drugs medicine take-back program, and Purdue College of Pharmacy. Laura Kammin, IISG pollution prevention program specialist, worked closely with Patricia Darbishire, a Purdue clinical associate professor of pharmacy practice, to get the ball rolling. The Yellow Jug Old Drugs program was started in 2008 by the Great Lakes Clean Water Organization working with pharmacies to collect and properly dispose of non-controlled substances to help reduce their impact on the Great Lakes. In September of 2014, the Drug Enforcement Administration (DEA) changed the rules to allow pharmacies to take controlled substances. 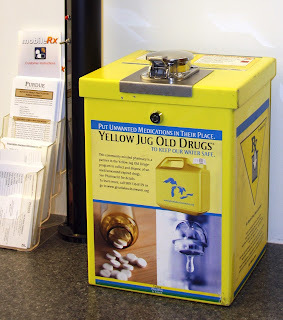 Individuals with unwanted medications can visit a participating pharmacy and dispose of both types of drugs in the yellow container that contains a substance that renders the pharmaceuticals non-retrievable. To date, The Yellow Jug Old Drug Program has properly disposed of more than 52 tons of prescription waste—which means a reduction of pharmaceuticals getting into waterways. Indiana Attorney General Greg Zoeller, who is the co-chair and founder of the state’s Prescription Drug Abuse Task Force, was also in attendance. Kammin was excited about the enthusiasm among the partners. “We all agree that we want to get drugs out of the community safely and to reduce the environmental impacts of improper disposal,” Kammin said. For more information about how to start a medicine take-back program in your community, contact Laura Kammin or Adrienne Gulley and check out more resources available at www.unwantedmeds.org.  Purdue University Retail Pharmacy accepts both prescription and over-the-counter medications, including pills, ointments, liquids, and creams, Monday though Friday from 8:30 a.m. to 5:30 p.m. The pharmacy is located at the Robert Heine Pharmacy Building, 575 Stadium Mall Drive, West Lafayette, Ind.